July | 2009 | Ipoh Mali Talak Sombong! *Notice: This is to inform my readers that my aunt passed away recently. If you happens to come across a CKT stall in the same area, it would be either run by her daughter-in-law or someone else. 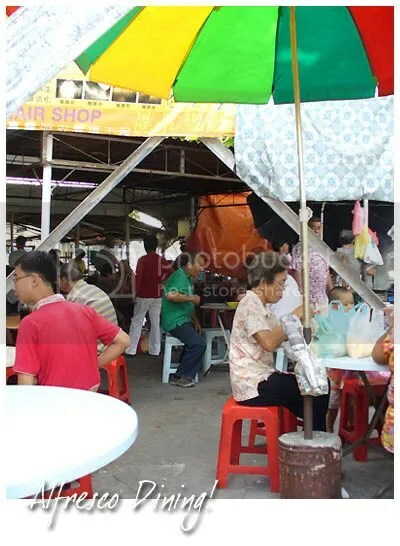 When I was still in primary school, I would tag along my parents to the wet market in Menglembu every Sunday. 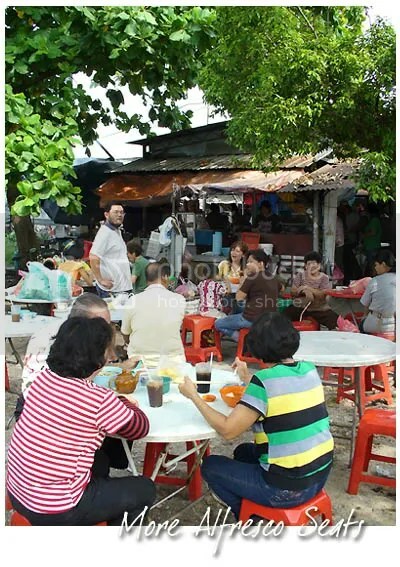 That was the only day in the whole weekend that we will go shopping (at the wet market, of course) and eat out. Usually after much bargaining, we would stop by at my aunt’s (dad’s eldest sister) stall for her char kuey teow. 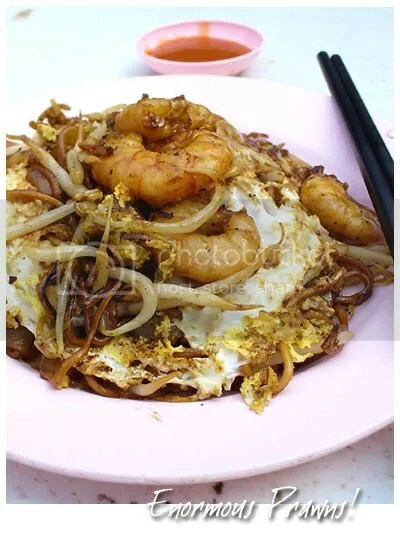 But Ipohan does not call it char kuey teow as this is supposingly a Hokkien word. We just call it chao fun (fried noodles). I took that as a compliment. 😛 Anyway, back to the food. While J2kfm remained calm, I was practically shocked upon seeing his plate of CKT loaded with big, succulent prawns. And there were 6 of them. 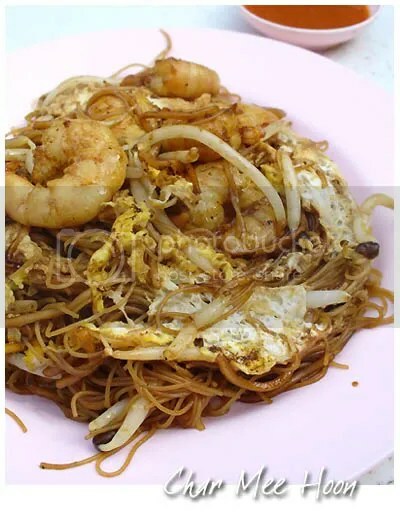 When my char mee hoon arrived, another 6 big ones lying on my plate. Since I don’t fancy prawns that much, you can imagine where my shares had gone to. That lucky fella. The noodles still taste the same as before and not so greasy. I particularly like the egg clinging onto-the-noodles-strands effect. The accompanied chilli sauce however, lacked the spiciness and garlicky taste. While the place is crowded every day, the crowd will eventually thin out around 10am when the sun started to shine mercilessly. I did not notice before this but most of the patrons here are aunties and uncles around 50-60 with their grandchildren. 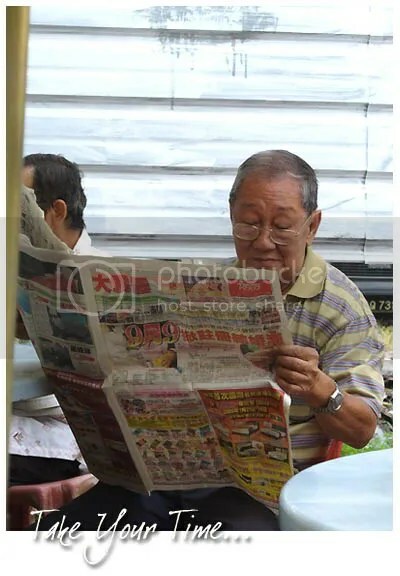 Young people like us doesn’t visit the wet market nowadays? Directions: If you’re coming from Ipoh old town, follow the signs to Menglembu/Falim/Lumut. You will find yourself driving along Jalan Lahat when you see TNB headquarters on your right. Go all the way straight for about 3-4 kilometres and you will see a roundabout with a giant peanut statue. Take the 12 o’ clock direction of the roundabout, and you will see police station on your right. The row of stalls are located just after the police station, before the traffic light on your right. What should I call this dish ah? Or does it have a name? 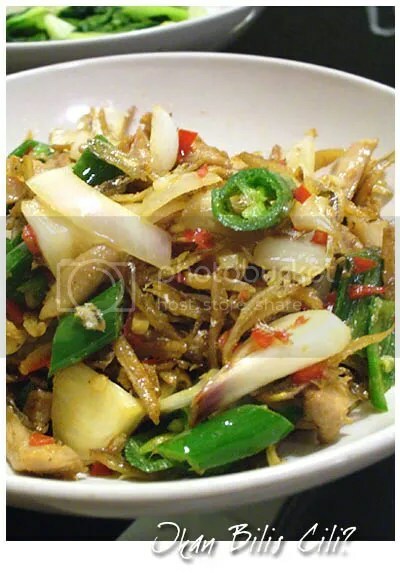 Mom used to prepare this dish with crispy lard, anchovies, some lean pork, green chillies and fermented bean paste (taucu) but I omitted the bean paste since I didn’t stock it in my fridge. Heat oil in wok, shallow fry the anchovies till golden and crisp. Remove from wok and set aside. Heat oil again, add garlic and pork. Flip and stir fry pork in medium heat till thoroughly cooked. Add in the green chillies, red chillies, anchovies and salt. Mix well. Add in sugar and stir to mix till the sugar slightly caramelized. Add in onion lastly and dish up. Serve hot with rice. So, shall I called it Ikan Bilis Cili? 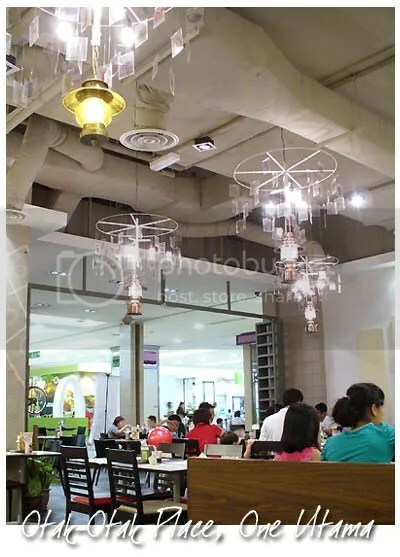 *continue from Act 1: Precious Pea’s Breakfast Excursion – Yang Kee Beef Noodles. After much yelling, humming and dancing by Simon, we were hungy again! And so we found our ways to Otak-Otak Place for tea time. As their tea time set only available at 3pm, some of us actually waited 30 mins just to order that! And while waiting, some had the grilled otak otak which was priced at RM 0.60 per stick (normal price RM 1.10) and entertained ourselves immensely by playing Happy Family, relieving the days when I played that with primary school classmates and neighbours. “May I have Mr Dauber?” “Sorry, not at home!” followed by evil grin and giggles. I went ahead and ordered the Cucur Otak-Otak (RM 5.50). 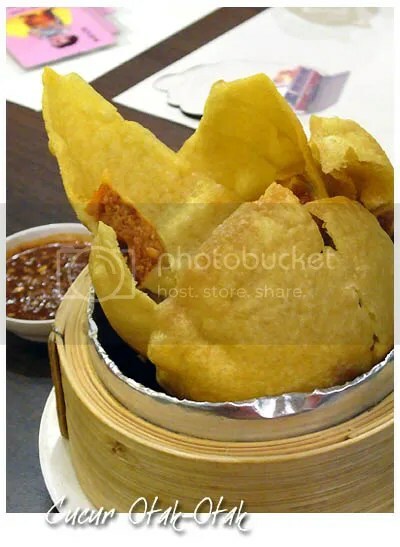 It resembles a large piece of cracker, cut into half with otak otak in the middle and served with a dip of homemade sambal. Taste-wise, it was rather hard and a bit greasy. 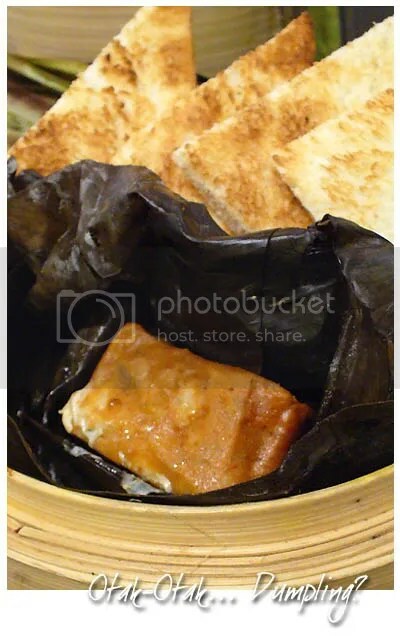 SC ordered another item on the menu (sorry, I couldn’t remember what is it) which looked like steamed otak otak with toasts. I didn’t try it, but I think I remember she mentioned about the texture not solid enough for her liking. 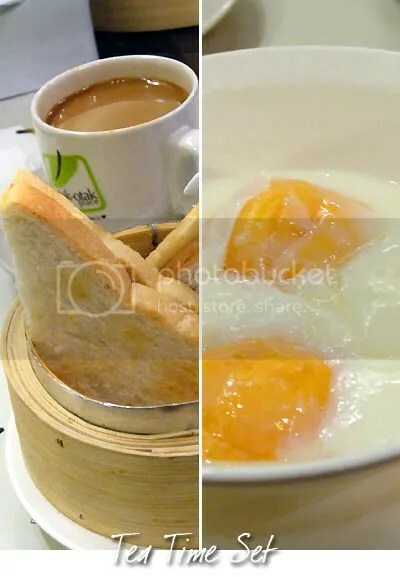 And one of their tea set is the toasts with soft-boiled eggs and a cup of coffee or teh tarik. Decent stuff, the teh tarik/coffee was pretty good by the way. And that concludes our makan trip for the day, which turned out to be the last food crawl I had with Precious Pea. As I typed this out, she had already set her foot on the ground of Melbourne-land, reunited with her sister, brother-in-law and nephew. I will miss her dearly; her laughter, her cooking, her company. I won’t forget the days when she came all the way to Cheras with Jackson and WMW to bring me out for dinner. I could only wait for the day when she comes back to Malaysia and we could have another food crawl again. Precious Pea, thank you for everything!